Archaeological Site of Nikopolis is part of the Tentative list of Greece in order to qualify for inclusion in the World Heritage List. 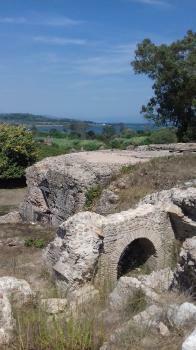 Nikopolis is the ruin of a roman city north of Preveza, on the western coast of Greece. Surprisingly for such a little known site, the ruins are quite large - there is a mile-long city wall, two large fields with remains and lots of smaller artifacts. It looks as if the antique city was larger than the present one ! However, there are no buildings remaining on the whole. What is left is mostly brickwork, floor constructions and street plasterings. It is all typical roman stuff - mosaics, pillars, floor heatings. There seem to be not a lot of people who visit the site - I was there at a weekend in high season, and the place was almost deserted. The area is surrounded by low vegetation with no modern building in sight, which enhances the athmosphere of an abandoned place. On the bad side, the site does not seem to be fully developed - the two main fields are a mile apart, and there is no path between them but the dusty country road. The associated museum is another mile away. A private car seems to be the best choice of visiting - I came with a taxi but couldn't visit everything, as long walks in the scorching greek sun were not advisable. The biggest problem of the site is that it is missing something spectacular, something special. Everything seems to be typical stuff you would expect from a roman ruin, and I have seen nothing that could not be encountered in another place. Still, it was a pleasant visit, and I wished I had more time planned for it (two hours were not enough). As for the WHS status, the OUV will be hard to justify here, with better examples of roman architecture already on the list.